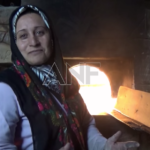 The first bakery to be founded and run by women in Rojava. 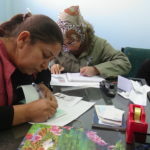 With the support of the TEV-DEM Women’s Economic Committee, six women were organised in a co-operative and began production in 2016, communally making the bread and sharing the revenue. In the Adar Bakery, the bread is produced communally, without an ambition for profit, and sold at a more affordable price than that of the marketplace. This is an important benefit to the nutrition of the society. They provide bread for free to those without financial means. Also, the sense of community is supplemented through their convivial, respectful and honest presence in society. In the Adar Bakery, three bags of flour are made into bread every day, both loaves and traditional flat breads. 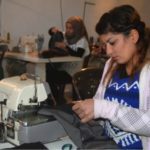 The women start work at 04:00, and work until 13:00-14:00. Located in Derik, Adar Bakery now has 9 members.